Laura Miller has a piece on Salon today titled "We Are What We Buy." Miller talks to Rob Walker, who has a new book, Buying In: The Secret Dialogue Between What We Buy and Who We Are and we find out that 77% of Americans think that they are perceptive when it comes to marketing pitches. Walker himself was one of them, until Nike bought Converse. "His cherished hipster/underground brand had been swallowed by the Nike swoosh, 'a symbol for suckers who take its 'Just Do It' bullying at face value.'" Miller writes. He'd bought into the notion that Converse was about a certain non-conformist individuality. And don't we all? There are subtle signals emanating from the things we buy. It's tough not to judge someone by their Crocs, Juicy Couture or Abercrombie. Some products don't technically advertise with huge campaigns — they sponsor events or associate themselves with certain groups instead — still are thought of in a certain light, something Walker calls "murketing." It's all too easy for people, under the influence of the siren songs of marketing (or murketing), to drift into a situation in which they use commodities "not to reflect who they are, but to construct who they are. Not to reflect a self, but to build a self." I'll admit that this part touched a nerve. I am a collector and a maximalist, or what my mother prefers to call a "pack rat" and someone who "loves junk." (That's a portion of my bookcase, above.) I adore bags. I used to collect typewriters and lunchboxes. Sometimes I scrapbook. I save magazines, I have a stormtrooper helmet and a Bruce Lee action figure. I like street signs and Hello Kitty boomboxes; platform shoes and weird cameras. I have lots of stationery, rubber stamps, books, postcards, CDs, DVDs, costume jewelry and I find it really really really hard to throw away old t-shirts, especially if they are or were well-loved. Do I need all this stuff? Is this stuff me? That's debatable. I have each item because I enjoy it. It's funny, meaningful, cool or associated with a memory. Would I be the same girl if I lived in an uncluttered, streamlined, minimalist apartment? Is my "stuff" actually a sign of an emotional problem? A new study by Blair Kidwell, David M. Hardesty and Terry L. Childers from the University of Kentucky says: "People with highly developed emotional sensibilities are better at making product choices." For instance: "A person can know a lot about nutrition and know what foods are not healthy, but can still make poor decisions when unable to recognize, reason, and solve problems based on emotional patterns." 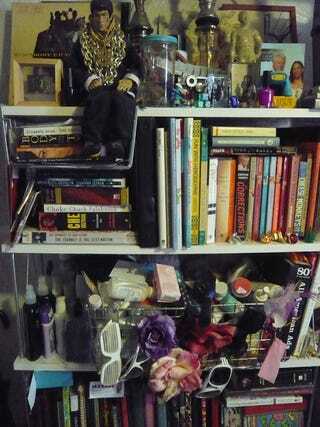 But when I think about my "stuff" I just think that yeah, it's cluttered, but I like it. A blank wall is boring and makes me a wee anxious. But I do wonder: Do interesting people have interesting things? Or does having interesting things make you interesting? And if not — surely there are interesting monks, for instance — why do we think possessions make a personality? Earlier: Does The Average Woman Really Have 21 Handbags?